We get a lot of questions regarding air ducts – what are they used for? Why do you need to hire professionals to clean them? Why do they even need cleaning in the first place? Well, let's shed some light on the matter and have air ducts explained. 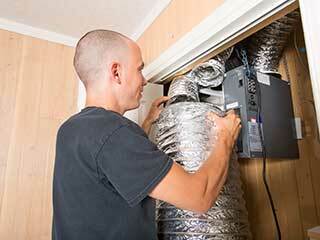 Air ducts are your house's breathing system. They carry fresh air from the outside (or from an A/C unit or system) and spread it throughout your different rooms and spaces. But that's not all – they also carry away used air and gasses and clear them out of the building. Think of them like veins and arteries running through your body, carrying blood and oxygen to and from each organ. Why Bother Cleaning The Ductwork? Would you leave your arteries clogged? Your windpipe partially jammed? Of course not, no one would. Your air ducts' cleanliness is just as important for your health and well being, even though they're far from the eye. The problem is that in order to serve their purpose they run through ceilings and walls that make them very hard to reach, at some points. That's where the professionals come into play. Imagine having a duct that runs high up in the ceiling where it can't be reached. Now imagine having that air duct clogged with dust, dirt and debris that came in from the outside and perhaps even dead rodents. The air that comes in passes through all of that in order to get into your house, room and lungs. Not a pretty picture. When you call Air Duct Cleaning Spring Valley you know your problems will be solved. Our expert technicians will arrive at your house fully equipped and assess the situation and its complexity and severity. They will then act on the plan they've prepared and start cleaning every duct until everything is left spotless. Only once everything is clean and you're completely satisfied will they wrap things up and head out. If you require professional air duct cleaning services anywhere in Spring Valley, all you have to do is give our team a call. Don't hesitate – we're willing, ready and able!